The Philippines is a country of Southeast Asia, with its 7,107 islands strewn over the Western Pacific Ocean, approximately 13 N of the equator and 122 E of Greenwich. Its collective land area is about 300,000 sq. km, about the size of the state of Arizona. This island archipelago is one of the most megadiverse countries in the world, housing over 5% of the entire world’s flora in an area not even 1% of the world’s total. An estimated 10,000 to 11,000 species of plants are believed to occur in the Philippines and likely many more if the tropical forests were fully explored and documented. Over half of the named plants are endemic. This high level of endemism is also present in the animals. Forty-four percent of its vertebrate species and almost 70% of its insects are also found nowhere else in the world (Catibog-Sinha and Heaney 2006). Among the world’s 25 top biological hotspots the Philippines ranks second in the number of species per square kilometer, thus the endemic species are concentrated in exceptionally small areas (Myers et al. 2000). Only 7% of its old growth closed-canopy forests remain from over 60% in 1945 (Heaney et al. 2004). Therefore, these species are under extremely high threats for extinction. As with any other developing nation, poverty, overpopulation, ignorance, and political corruption continue to threaten the remaining biological riches of this country. With so many islands, the Philippines surpasses Hawaii and the Galapagos in species biodiversity and endemism, and would be the perfect system to understand why it is a cauldron of evolution. In fact, the Philippines has been described as tenfold more diverse than Galapagos (Heaney and Regalado 1998). As predicted by Wilson and MacArthur’s (1967) theory of island biogeography, different island sizes, ages and distance from mainland Asia have influenced colonization, extinction, and diversification rates of Philippine biota. These island features coupled with their individual geological histories throughout the Cenozoic may hold the answer as to why the Philippines is one of the world’s most biodiverse regions. As Australia drifted northward and began to collide with Asia, tectonic pressure caused parts of the Pacific seafloor to uplift, producing volcanoes that gave rise to the Philippine islands. Sometime in the mid-Oligocene, about 30 mya, the Philippines was starting to take shape with the development of three major geological blocks (Fig. 1A). The first unit, which now comprise modern day Palawan and Mindoro and other smaller islands, rifted from the Asian continental shelf, south of the current location of Taiwan. At about the same time, hundreds of kilometers southeast of its present-day location, proto-Luzon, which began as a string of small volcanic islands developing beneath a shallow sea, was moving northwest. Further southeast of proto-Luzon, the islands of the Visayas and Mindanao were borne out of the continued subduction of the converging plates in the Pacific, and were also migrating northwest. Throughout the Cenozoic, these major geological units were approaching one another, but it was only in the Miocene that they began to emerge above sea level (Fig. 1B). About 10 mya (Fig. 1C) Mindoro was uplifted and large land areas were already exposed for the two other geological units. Starting in the Pliocene, 5 mya (Fig. 1D), Palawan emerged, while other smaller islands and peninsulas such as Bicol, Camiguin and Sibuyan, and the Sulu islands only surfaced much later (Hall 1998; Heaney and Regalado 1998; Steppan et al. 2003). The 7000+ islands of the Philippines had never been connected to any other Asian landmass, except for Palawan, which became contiguous with Borneo when sea level dropped repeatedly during the Pleistocene, accounting for Palawan’s biotic similarity to the former. The isolation of the Philippines from the rest of Asia allowed it to develop its unique flora and fauna, thus explaining its staggering levels of endemism. Moreover, many species are not only endemic to the Philippines but unique to individual Philippine islands. Other islands, like Negros and Panay, share faunal species which surprisingly are different from those on other adjacent Visayan islands such as Leyte and Samar, whose fauna are, in turn, more similar to those of Mindanao. Masbate’s fauna are also more related to Negros and Panay’s than they are to the more proximal Luzon. These patterns were observed in many vertebrates including birds (Peterson et al. 2000), amphibians (Evans et al. 2003), mammals (Heaney and Regalado 1998; Steppan et al 2003; Roberts 2006; Esselstyn and Brown 2009), reptiles (McGuire & Heang 2001), and fishes (Carpenter and Springer 2005). Fig. 1. Postulated distribution of land and sea in Southeast Asia in the Cenozoic. A. 30 mya. B. 20 mya. C. 10 mya. D. 5 mya. Figures from Hall (2002). Though the country’s ancient geology, beginning at least in the Oligocene, had undoubtedly shaped Philippine biodiversity, biotic similarities of certain island groups only make sense in the light of the country’s Pleistocene history. About 2 mya, water evaporating from the oceans formed very thick glaciers that blanketed temperate regions for thousands of years, thereby resulting in global sea levels 120 m below present. This allowed certain islands of the Philippines to coalesce, forming Pleistocene island groups (Heaney and Regalado 1998; Fig. 2), but after some time, the glaciers melted thereby disconnecting these islands. This cycle went on repeatedly several times with the last glacial episode culminating 12,000 yrs ago and could explain the biogeographic patterns seen in many Philippine vertebrate taxa (Catibog-Sinha and Heaney 2006). 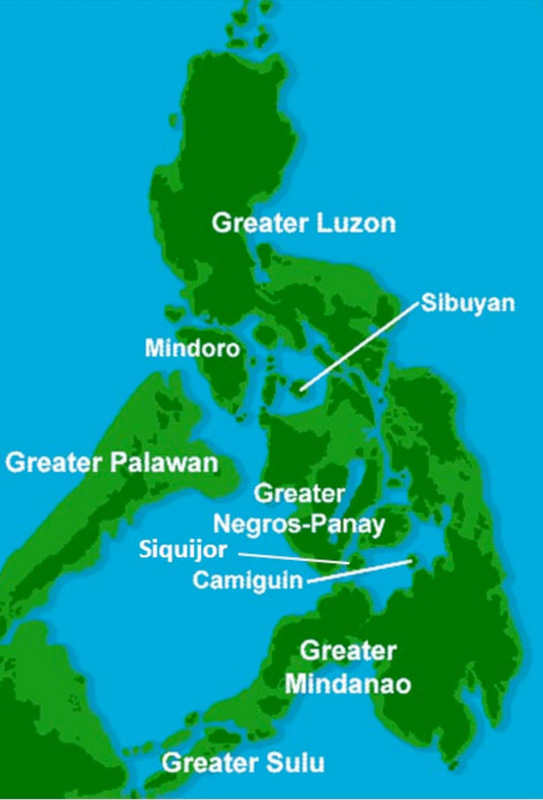 During glacial events, five major Pleistocene island groups became prominent: Greater Luzon (composed of Luzon, Catanduanes, Marinduque and Polillo); Greater Mindanao (Mindanao, Bohol, Leyte, Samar, Basilan); Greater Negros-Panay (Cebu, Masbate, Negros, Panay); Greater Sulu (Tawi-Tawi, Sulu); and Greater Palawan. Except for Palawan, these Pleistocene island groups have never been connected to one another nor to the Asian mainland. The islands of Mindoro, Sibuyan, Camiguin, and Siquijor have also remained isolated from any other island (Heaney and Regalado 1998; Catibog-Sinha and Heaney 2006; Fig. 2). Thus, it is not surprising that each of these Pleistocene islands harbors unique set of species. For example, 76% of the non-flying mammals in Greater Luzon do not exist anywhere else, and the number for Greater Mindanao is even higher at 79% (Catibog-Sinha and Heaney 2006). Even the tiny, less than 500 sq. km and solitary island of Sibuyan, has its own impressive array of endemic species, in spite being only a few kilometers away from Luzon. It would seem reasonable to think that the recurring coalescence and fragmentation of certain islands during the Pleistocene were responsible for generating much of Philippine biodiversity, i.e. the Pleistocene speciation hypothesis (Steppan et al. 2003). However, this was not the case, at least for the species of a Philippine endemic rodent, in which the timing of speciations occurred pre-Pleistocene, during the Pliocene (Steppan et al 2003; Jansa et al. 2006). The same story was reported for an endemic Philippine fruit bat, whose genetically different populations resulted from Pliocene diversifications (Roberts 2006). Nonetheless, for both taxa, monophyletic groups are generally confined within the boundaries of each Pleistocene island. This has led Heaney et al. (2005) to conclude that distributional patterns of non-vagile mammal species are generally consistent with the expectations of Pleistocene geography, and that the latter may be predictive of the biogeography of other species in oceanic archipelagoes. However, not all Philippine species obey the Pleistocene geography model and show complex diversification patterns; many even exemplify cryptic speciations. For many Philippine bird species, allopatric differentiations occurred after colonization of different islands (Oliveros and Moyle 2010; Jones and Kennedy 2008). This was also observed in Philippine shrews (Esselstyn et al. 2009) and skinks (Siler et al. 2011). In their study of Philippine geckos, Siler et al. (2010) were convinced that, though the Pleistocene geography model has influenced terrestrial biodiversity patterns, it might be an oversimplified paradigm, and that clade age, phylogenetic diversification, ease of dispersal, and post-Pleistocene geography may be invoked to explain vertebrate species diversity. But do the same biogeographic expectations hold for Philippine plants? Do non-vagile species have distributions that reflect the predictions of the Pleistocene model, while more easily-dispersed species show more complex biogeographic patterns? Surprisingly, this model has never been examined in Philippine plants. In fact, of the 74 references in ISI Web of Science that included the search terms “Philippine biogeography”, only three were on plants (Tan 1996; Linis 2009; Linis 2010). All three studies concerned mosses, they were based soley on distribution data for individual Philippine islands, and none of them used phylogenetic methods to test the model. Biodiversity studies on Philippine plants are greatly lacking. A complete flora for the country is lacking with the checklist of Merrill dating to 1923. Botanical surveys for the Philippines lag behind other comparable Malesian regions, with Java and Peninsular Malaysia having at least 187 and 145 plant specimen collections per 100 sq km, respectively, while the Philippinesis a paltry 84 (Tan and Rojo 1989). Only <2% of the country’s flora have also been evaluated by the International Union for Conservation of Nature (IUCN; Catibog-Sinha and Heaney 2006). Even several species of Rafflesia, the world’s largest flower, known to grow to over 3 feet in diameter, have practically gone undetected in the Philippines for the past 150 yrs, and it was only in the last decade that 8 new species have been discovered, thus bringing the national total to 10 (Barcelona et al. 2009, 2011). Incredibly, all but one of these species are single-island endemics, and seem to follow the Pleistocene model. A phylogenetic study of the group is underway to confirm this. We hope that through this website, we can motivate phylogenetic and biogeographic studies on Philippine plants, to learn the mechanistic processes of evolution in island archipelagoes, to understand how ancient geology, Pleistocene geography, and tropical climate, acting on a matrix of many islands of varying sizes, ages and proximities have come together to produce a unique smorgasbord of species. This work is urgent given that many of these species, sadly teetering on the brink of extinction, exist in one of the world’s most severely threatened biological hotspots. Barcelona, J. F., P. B Pelser, D. S. Balete, and L. L. Co. 2009. Taxonomy, ecology, and conservation status of Philippine Rafflesia (Rafflesiaceae). Blumea 54: 77-93. Barcelona, J. F., E. S. Fernando D. L. Nickrent, D. S. Balete, and P. B. Pelser. 2011. An amended description of Rafflesia leonardi and a revised key to Philippine Rafflesia (Rafflesiaceae). Phytotaxa 24: 11-18. Carpenter, K.E. and V.G. Springer. 2005. The center of the center of marine shore fish biodiversity: the Philippine Islands. Environmental Biology of Fishes 72: 467–480. Esselstyn, J.A. and R.M. Brown. 2009. The role of repeated sea-level fluctuations in the generation of shrew (Soricidae: Crocidura) diversity in the Philippine Archipelago. Molecular Phylogenetics and Evolution 53:171–181. Esselstyn, J.A. et al. 2009. Do geological or climatic processes drive speciation in dynamic archipelagos? The tempo and mode of diversification in Southeast Asian shrews. Evolution 63-10: 2595–2610. Evans, B.J. et al. 2003. Phylogenetics of fanged frogs: testing biogeographical hypotheses at the interface of the asian and Australian faunal zones. Systematic Biology 52:794–819. Hall R. 1998. The plate tectonics of Cenozoic SE Asia and the distribution of land and sea. In: Hall R and Holloway JD, eds. Biogeography and Geological Evolution of South East Asia. Leiden: Backhuys Publishers, 99–131. Hall R. 2002. 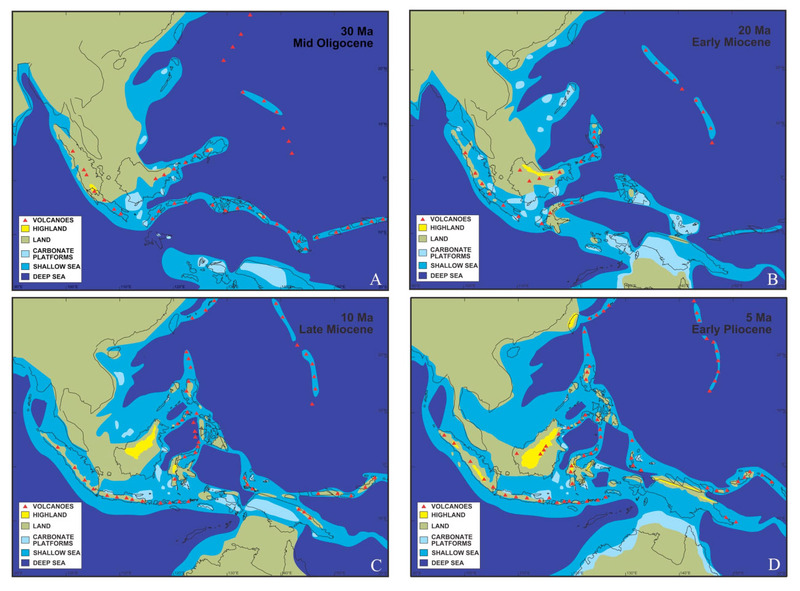 Cenozoic geological and plate tectonic evolution of SE Asia and the SW Pacific: computer-based reconstructions and animations. Journal of Asian Earth Sciences 20: 353–434. Heaney, L.R. and J.C. Regalado, Jr. 1998. Vanishing Treasures of the Philippine Rainforest. The Field Museum, Chicago. Heaney, L.R. et al. 2004. Philippines. In R.A. Mittermeier, P.R. Gil, M. Hoffman, J. Pilgrim, T. Brooks, C.G. Mittermeier, J. Lamoreux, and G.A.B. da Fonseca (eds. ), Hotspots Revisited: Earth’s Biologically Richest and Most Endangered Terrestrial Ecoregions. Mexico City: CEMEX. Heaney, L.R. et al. 2005. The roles of geological history and colonization abilities in genetic differentiation between mammalian populations in the Philippine archipelago. Journal of Biogeography 32: 229–247. Jansa, S.A. et al. 2006. The pattern and timing of diversification of Philippine endemic rodents: evidence from mitochondrial and nuclear gene sequences. Systematic Biology 55:73–88. Jones, A.W. and R.S. Kennedy. 2008. Evolution in a tropical archipelago: comparative phylogeography of Philippine fauna and flora reveals complex patterns of colonization and diversification. Biological Journal of the Linnean Society 95: 620–639. Linis, V.C. 2009. Biogeography of Mindoro mosses. Blumea 54: 290–296. Linis, V.C. 2010. The moss flora of Camiguin Island, Philippines and their floristic relations to some adjacent islands in the archipelago. Telopea 12: 525–542. MacArthur, R.H. and Wilson, E.O. 1967. The Theory of Island Biogeography. Princeton, N.J.: Princeton University Press. McGuire, J.A. and K.B. Heang. 2001. Phylogenetic systematics of Southeast Asian flying lizards (Iguania: Agamidae: Draco) as inferred from mitochondrial DNA sequence data. Biological Journal of the Linnean Society 72: 203–229. Myers, N. et al. 2000. Biodiversity hotspots for conservation priorities. Nature 403: 853–858. Oliveros, C.H. and R.G. Moyle. 2010. Origin and diversification of Philippine bulbuls. Molecular Phylogenetics and Evolution 54: 822–832. Peterson, A.T. et al. 2000. Distribution of the birds of the Philippines: biogeography and conservation priorities. Bird Conservation International 10:149–167. Roberts, T.E. 2006. Multiple levels of allopatric divergence in the endemic Philippine fruit bat Haplonycteris fischeri (Pteropodidae). Biological Journal of the Linnean Society 88: 329–349. Siler, C.D. et al. 2010. Phylogeny and biogeography of Philippine bent-toed geckos (Gekkonidae: Cyrtodactylus) contradict a prevailing model of Pleistocene diversification. Molecular Phylogenetics and Evolution 55:699–710. Siler, C.D. et al. 2011. Phylogeny of Philippine slender skinks (Scincidae: Brachymeles) reveals underestimated species diversity, complex biogeographical relationships, and cryptic patterns of lineage diversification. Molecular Phylogenetics and Evolution 59:53–65. Sinha, C.C. and L.R. Heaney. 2006. Philippine biodiversity: Principles and Practice. Manila: Haribon Foundation Inc.
Steppan S.J. et al. 2003. Molecular phylogeny of the endemic Philippine rodent Apomys (Muridae) and the dynamics of diversification in an oceanic archipelago. Biological Journal of the Linnean Society 80: 699–715.